Students enrolled in journalism classes at Pattonville High School have launched Sports Center on PattonvilleTODAY.com. The journalism website now manages and displays upcoming varsity games, recent scores, team rosters and stories written by students all in one centralized location. 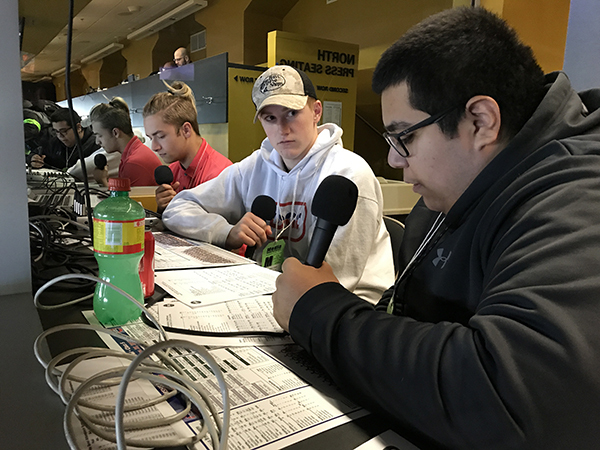 Students enrolled in Pirates Sports Network and the other four journalism class offerings (Pirate Press Newspaper, Echo Yearbook, Introduction to Journalism and Photojournalism) research, report, conduct interviews and take pictures to keep Pirates fans up-to-date on a variety of stories. Students have already published podcasts and articles on sports highlights, achievements and events in addition to the news, entertainment and feature articles already published on the journalism website. All of the work published on the website is created by students enrolled in the classes. Teacher Mr. Brian Heyman is the adviser for the student publications. “I am excited for this extension to the journalism program,” Heyman said. “We covered the football team this year and saw the amount of people interested in stories about the student-athletes. We want to expand that coverage in the newspaper, yearbook and website to every team at Pattonville." Visit the sports website at PattonvilleTODAY.com/schedules and check back regularly for new coverage. To learn more about the journalism classes offered at the high school, visit PattonvilleTODAY.com/join.